Pasta a la Bolognese! I have been loving saying this repeatedly over the last few days. I get to say it loud and proud with an Italian accent, because I want to, that is all there is to it. I am looking for the right meat sauce, meat to tomato sauce ratio perfection. This is it, I am done. Now do not get me wrong, this is not a tomato meat sauce, this is a meat tomato sauce. There is a difference, trust me, we talked about it, and figured it all out. But for reals, the flavor of this slow simmer crock pot loving sauce is bread slopping up sauce goodness. Yes, it is that good. So go buy good bread, or make it, or whatever, and cook a bit but not too much because this is in fact a slow cooker recipe. It most certainly does not have to be, it can be done in a pot, but slow cooker I did. Do try, it is worth every bite with leftovers, unless you have a big family, or friends over to eat it. Either way, enjoy. 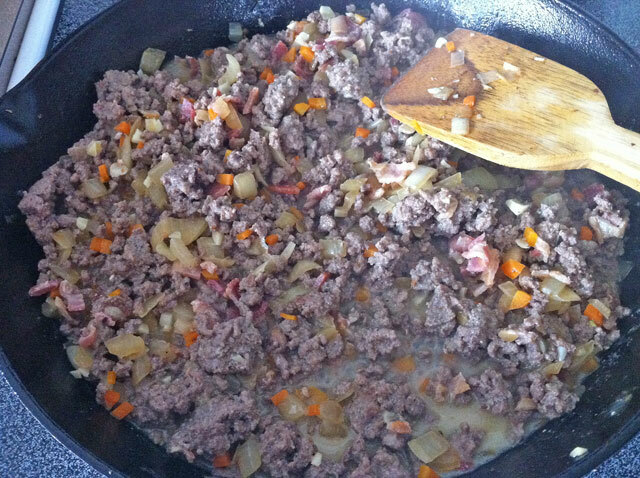 Note: Bolognese can be made with a variety of meats, usually a mix of a couple. You can use ground veal, ground pork, pancetta, or ground beef, it is up to you and what you like. I had beef and bacon, so that is what I used. 1. In a 12 inch cast iron skillet or regular large skillet…Get it nice and hot, add the bacon, cook until almost crispy. Remove onto a paper towel. Chop it up when it cools. Leave the bacon fat in the pan. Lower the heat to medium, add the onions, cook for 10 minutes. Add a little olive oil if you need it, about 1 tbsp. Add the carrots, cook for 5 minutes. Add the celery, and garlic, cook until fragrant. Set aside in a bowl. 2. Get the pan over medium high heat to brown the ground beef. Brown for about 10 minutes, add a pinch of salt, then add the onions mixture back to the pan with the meat. Season with 1 tsp salt, a pinch of black pepper, and the nutmeg. Add the milk. You are looking to reduce the milk to pretty much nothing, so let this cook over medium high heat (without burning the meat) until the milk has evaporated, about 10 minutes. Stir frequently. Add the wine and do the same, reduce until it has evaporated. Add the bacon. 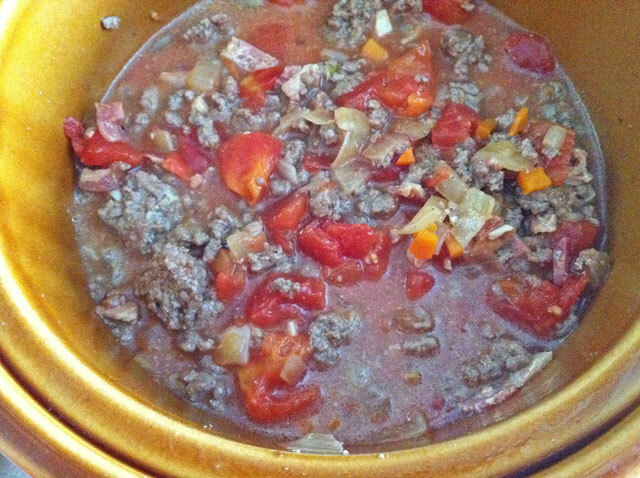 Add the tomatoes, and tomato juice, stir to combine, then add all of it to a slow cooker. 3. Cook for 5 hours on high, remove the lid for the last 1 1/2 to reduce/evaporate most of the liquid. Skim any fat off the top if necessary. Or cook on low for 8 hours, the last 1 1/2 take the lid off to reduce the liquid. You want a very thick meaty tomato sauce. Stir it once in a while, if you are home. Check the seasoning when it has reduced to almost the right consistency. If you add too much salt in the beginning, it will be too salty once it has reduced. Season with salt and fresh ground black pepper to taste. 4. 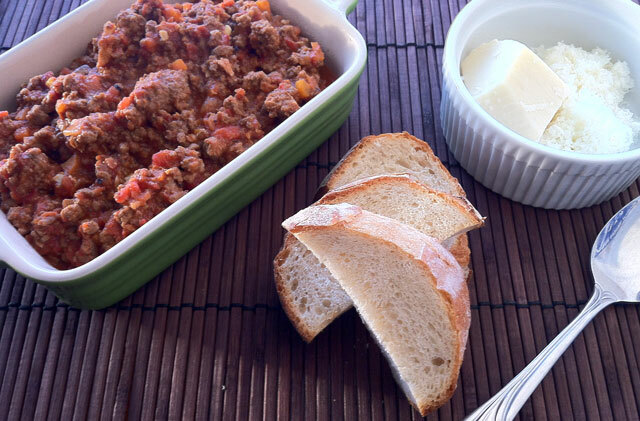 Serve with your pasta of choice, freshly grated parmigiano reggiano, yummy bread, and a nice salad. If you are going to cook it on the stove: Cook it over low heat for about 4 hour with the lid on. Remove the lid for the last hour to reduce the liquid. Stir frequently.